According to the latest annual World Press Trends survey issued by the World Association of Newspapers and News Publishers (WAN-IFRA), 2.7 Billion adults worldwide read newspapers in print. Circulation growth can mainly be attributed to gains made in Asia – in China and India in particular. The largest newspaper markets are the US, Japan, Germany, China, the UK, India and Brazil. 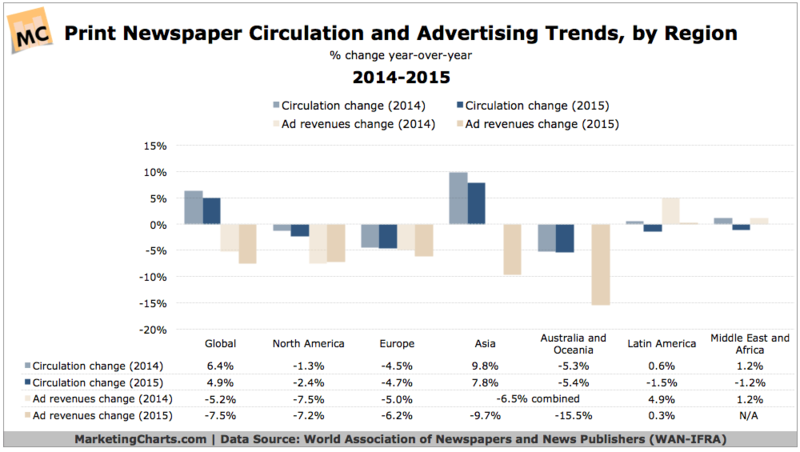 Print circulation increased 4.9% overall in 2015 over 2014. In a separate study on advertising effectiveness, newspaper ads have reportedly influenced 13.1% of US adults to make a purchase in the past 6 months whereas social networking ads have only influenced 10.3%. 92% of newspaper revenues are derived from print. For help reaching your target audience via print, contact us at info@mediabids.com or at 860-379-9602.